From Karts to Cars (1988 - 91). fellow German Heinz Harald Frentzen. In 1988 Michael moved to car racing and competed in both the Formula Ford and Formula Koenig championships. He was beginning to attract international attention as he won Koenig by a large margin and was second overall in the Formula Ford 1600 Euroseries, being beaten to the championship by another future F1 star, Mika Salo. It was around this time that Michael gained a manager - former driver Willi Weber, who had seen Michael racing in Formula Ford and wanted the youngster to drive for him in Formula Three. In testing, Schumacher was 1.5 seconds quicker than Weber's own driver and was signed up on the spot. They have been together ever since. Michael spent the 1989 Formula Three season competing against fellow German Heinz-Harald Frentzen (pictured with him left), who also became his partner (with the Austrian Karl Wendlinger) in the Mercedes sportscar team in 1990. The two became close friends despite Frentzen's superiority over Michael on the racetrack, which he has always been at pains to deny. Michael experienced his first real taste of controversy in 1990 at a sports car race at Silverstone, England (a circuit that would cause him further troubles in 1994 and 1999), when he was disqualified during a practice session for not wearing a seatbelt. The position Michael adopted here was the one he proved to take in all subsequent disputes: he was in the right, and his opponents were wrong: "Its crazy. I think that England was the problem" (1). 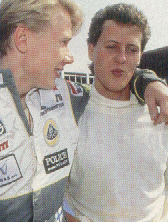 More controversy soon followed when Michael clashed with the Finnish driver Mika Hakkinen (pictured with him right) at the most important F3 race of the season in Macau, China. Hakkinen had won the first heat so needed only second place in the next one to win the overall event, but wanted to finish the season on a high note. Frustrated at finding himself unable to pass Michael in the early stages of the race, Hakkinen tried to overtake on the last lap, realising that it was now or never. The German moved to block him and the Finn clipped the back of Michael's car, vaulting into the barrier and spinning off the track into retirement. The race was Michael's and Hakkinen was left disconsolate and in tears, much as he would be nine years later at the Italian Grand Prix after an elementary mistake cost him the lead. Although Michael later claimed that when he apologised to Hakkinen that evening the Finn admitted blame, bad feeling remained and Hakkinen vowed revenge - which he finally got in 1998 (see below). The story of how Michael got his break in Formula One is far from conventional - another driver's misfortune gave him an unexpected opportunity in the middle of the 1991 season to drive for a F1 team. As Michael was contending the fifth round of the World Sportscar Championship at the Nurburgring, Germany, Weber received a call from an old (and very worried) friend. This was eponymous Irish F1 team boss Eddie Jordan, whose driver Bertrand Gachot had just been sent to prison for spraying mace in the eyes of a taxi driver after a traffic altercation. Weber persuaded him to take Michael on after an impressive test session. Schumi had arrived. 1) See Collings, Timothy (1995) Schumacher: The Life of the New Formula One Champion (revised edition), Bloomsbury, London, p.36.